One of the most common questions I get asked as a physical therapist is “what is the best position to sleep in?” Followed immediately by “what is the best mattress to sleep on?” Now, I am by no means a mattress expert, nor do I ever desire to be one. What I can advise you on are the sleeping positions that place your body into positions of best alignment, thereby decreasing your likelihood of sustaining a sleep-related injury. I’m guessing that as soon as you read that phrase “sleep-related injury” you chuckled and thought ‘what a ridiculous concept’. And yet, that is exactly what I see day in and day out at my clinic. People coming in saying that their pain is the worst in the morning, or seemingly worsened by what was otherwise supposed to be a good night’s rest. Sleep is supposed to be something restorative that allows our body time to heal, recover, and grow. While we are sleeping we’re clearly not running, lifting hundreds of pounds over our heads, or cycling mile after mile. So what the heck is happening that people are waking up with pain and stiffness and a general feeling of being crippled? You’re sleeping like an idiot, that’s what. For those of us lucky enough to get seven or more hours of sleep per night, spending even a portion of those hours in a bad posture is a recipe for disaster. In fact, regardless of whether you sleep for eight hours or three hours, the same notion holds true. If you spend any prolonged amount of time sleeping with your neck craned at a ridiculous angle, your leg up by your shoulder, or your arms underneath your body, please don’t ask me why you have pain in the morning. As is the goal with basically everything in life, when you’re sleeping you want to have the best spinal alignment possible. Whether you’re standing, sitting, or flat on your back, if your cervical spine (neck), thoracic spine (upper back), or lumbar spine (low back) are not lined up with each other, you’re gonna have a problem. To that end, ‘ideal’ sleeping posture places your spinal curvatures in supported positions with a neutral alignment. Mattress: By and large this is the most ideal position for sleeping. The kicker is, you need to have the right amount of support from your sleeping surface. Kelly Starrett does a great piece on this, explaining how the appropriate amount of mattress support is just as important as sleeping position. At one point in time firm mattresses were all the rage, a virtual panacea for all things back pain related. Not the case anymore. For those with the dreaded anterior pelvic tilt and forward head posture (aka pretty much everyone these days thanks to hours spent at the desk), sleeping on your back on a firm surface with a bad pillow places a significant amount of stress at your neck and low back. A great way to test this out as per K-Star is to lay on your back on your bed with your arms and legs fully extended and relaxed. You should be able to maintain this position for at least one minute without having to cross your legs or shift your body or move your arms behind your head. Performing any of these movements is a method of escaping that over-extended position and decreasing the tension through your body, something that the proper resting surface should do for you. 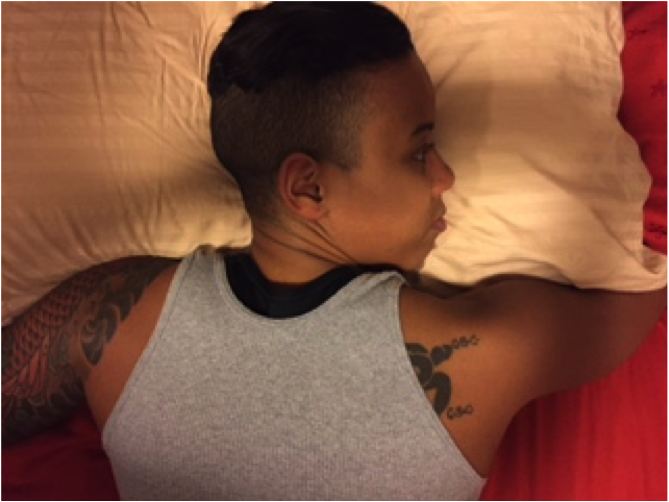 If you’re a back sleeper, your bed should be soft enough to support the curves of your spine and maintain a neutral positioning. If your bed is too firm and you’re having a tough time with this, a pillow can be placed under the knees to decrease strain at the low back. Pillow hugging for shoulder pain. notice in the picture on the right how the shoulder is able to relax and drop back into the socket. Pillow: The proper pillow for all you back sleepers out there should allow you to maintain a neutral curve at that cervical spine, with your head neither too far tilted forward or extended backwards. The pillow should be plush enough to fill the space at the back of your neck and allow your cervical spine to remain in a neutral position. If you have a tendency of putting your arms under your head while you’re sleeping on your back, cut it out right now. Doing so places the nerves and vascular components of the upper extremities in a compressed position, cutting off circulation and causing numbness and tingling. If you’re a snorer this isn’t the most ideal sleeping position so you’re going to want to consider side sleeping. A helpful hint for those of you experiencing shoulder pain. Try placing a pillow on your chest and hugging it with your arms. This will allow that shoulder to drop back in the socket and sit in a comfortable resting position. Mattress: Another ideal sleeping position is on your side, with the caveat that your spine needs to actually be supported and remain neutral. Again, mattress firmness plays in integral role in the benefit of this position. Firmer is NOT better, as you want a mattress that is able to adjust to the contours of your body, particularly if you have hips. Additionally you don’t want your shoulder being crushed between your body and a piece of cement. As for what to do with that bottom arm, your best bet is to keep it down by your side if possible, though I find that to be extremely uncomfortable. A recommendation is to place it straight ahead of you and then hug a pillow. If you’re sleeping with someone else in your bed I shall leave it up to you to decide how to make this work. Spooning is overrated, it’s all about dem gains! Folding the arm up under your head/pillow really isn’t ideal at all, as once again it compresses those neural and vascular structures. You also want to avoid sleeping in a true fetal position with your knees all the way up by your chest. This puts your spine in an excessively flexed position, and once again, we’re going for neutral. Having both knees in a mild degree of flexion is more ideal, and of course we all know about using a pillow between the knees to help maintain neutral pelvic alignment. Try to avoid rolling forward with one knee bent and one knee straight as this once again takes us out of neutral alignment at the spine and pelvis. Pillow: Proper pillow support is extremely important for the side sleeper. One of the most common errors I see is under-supporting the cervical spine. If you’re going to sleep on your side you absolutely must have a pillow that is plush enough to fill the contour of your neck and allow your head to remain in a neutral position. This means the pillow must be large enough to fill the gap between your ear and shoulder, allowing your nose to remain inline with your sternum. A great way to achieve this without going out and buying 50 different pillows is to roll up a small towel and place it inside the bottom of your pillowcase. The towel roll should fall directly in the small of your neck, supporting your spine while the pillow supports your head. You may need to bunch up your pillow or even use two pillows to ensure that your neck is supported and your head is neutral. Play around with it and see what works best for you. This is the big no-no position that basically every article on the internet discussing sleeping positions will lead you to believe will get you a direct ticket to the emergency room. While you’re not going to die from sleeping on your stomach, you really do want to avoid sleeping this way if possible. For starters, sleeping on your stomach forces you to turn your head so that your face isn’t buried in your pillow causing you to suffocate. Sleeping with your neck rotated places the joints of the cervical spine in a compressed position and creates imbalances in soft tissue structures of the neck. Additionally, sleeping on your stomach causes your low back to arch more as you sink into the bed with your head propped up on that pillow, increasing that lumbar lordosis we’ve discussed so many times, and placing excessive stress on the spine and soft tissues of the back low back. If you absolutely must sleep on your stomach, don’t. It’s bad for you. Check yo’self: I purposely avoided discussing specific mattress brands/types in this article because that’s not my area of expertise, and in reality you need to get out there any try them out for yourself. I realize it’s a huge investment, but considering you spend nearly a third of your life there, it’s worth it. In the meantime, think about how you feel in the morning and then take a look at your sleeping posture. If your sleeping posture is crap, you’re going to wake up feeling crappy. Get a better mattress, get a better sleeping position, and get to feeling better. Your body will thank you.